Mullvad is the VPN service provider that we decided to test and review on our systems, since it’s among one of the most high-ranked solutions of this kind and quite honestly, although at first sight there seems to be nothing about its name that should catch one’s attention. 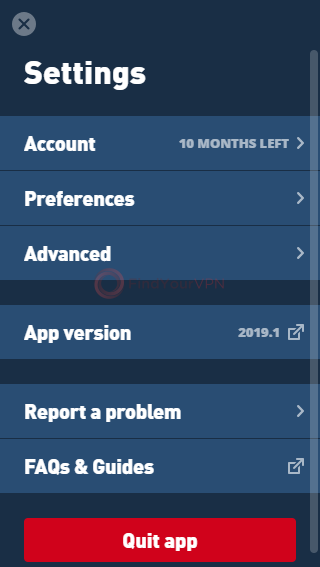 We’ve stated that at first sight, the name of this application isn’t very suggestive by itself, you don’t get a “security” or “privacy” hint when saying it out loud or thinking about it, it doesn’t even have VPN in its name (much like other similar VPNs). However, upon further analysis, we discovered something interesting. Since the company behind this project is based in Sweden, we decided to look up the translation of Mullvad and see if anything interesting pops out. Well, it did! It appears that mullvad means mole, or if used figuratively, spy or whistleblower. Here’s where the hint was hiding. Not much other information could be dug about this company except that the name of the company (Amagicom) is derived from a Sumerian word, “ama-gi,” which stands for “freedom” or “back to mother” (slavery context) if you want the literary version and “com” which is an abbreviation for “communication.” Add them up and you get “Amagicom,” which translates to “free communication.” Pretty clever, both the company name and their product’s name are a bit of play on words. “March 2009 – The Mullvad VPN service launches! July 2010 – In the name of our customers’ anonymity, we start accepting Bitcoin payments. September 2010 – Customers can now start paying in good ol’-fashioned cash, another win for anonymous payments. September 2014 – We launch IPv6 support (this is a really nerdy thing, but trust us, it’s cool). As you already know, the company is based in Sweden, which might seem harmless to begin with, but, if you’re familiar with online privacy and intelligence agencies, you’re probably aware that Sweden is a member of the 14 Eyes Alliance. The 5, 9 and 14 Eyes Alliances are teams of countries (each alliance being an extension of the previous one) which cooperate in collecting and sharing mass surveillance data. However, just because a country is a member of such an alliance doesn’t mean that every single service that operates in its territory has to bend the knee and give up private data concerning their customers. So we have to make sure both Mullvad and Amagicom AB are as clean as a whistle (since they claim that they are) and inform you of the outcome. 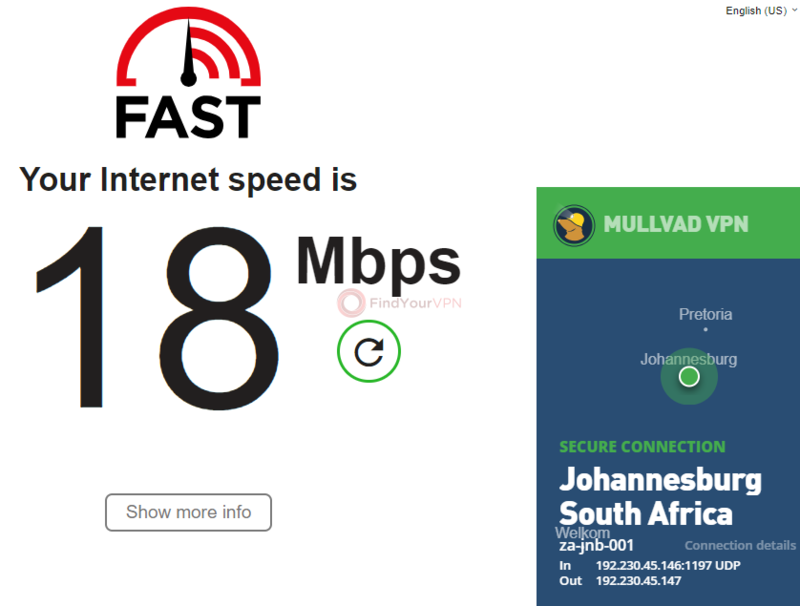 You’ll be glad to know that Mullvad VPN tried a different approach regarding their online presence. Once you’ll visit their website, you’ll understand why. Basically, you’ll see a solid statement regarding privacy and how it should be treated as a fundamental and universal right. Technically, they also point out that you can benefit from their service for a certain price, but it doesn’t poke you right in the eye as soon as the page finishes loading. Instead, it’s a piece of discreet information, well-hidden, blended among their stand on privacy rights. Well done! We’ve also noticed important notices regarding Mullvad displayed directly on the homepage, so the chances that you’ll miss it are pretty slim. If you were curious enough to visit their website and saw what we were talking about with the privacy statements and whatnot, you can “dig deeper” by simply scrolling down and finding out more about their project. Among things like “Evade Hackers,” “Easy to use” and the sort, something else caught our eye: “Keep your privacy.” This section informs us that Mullvad keeps no activity logs, doesn’t ask for personal information and they even advocate for anonymous payments and get this: in order for the payment to be anonymous it doesn’t necessarily need to be via crypto-currency. We’ll talk about this later. Right from the start, we notice the “no-logging” notice at the top of the page but we want the details, too. So we move forward and that no “activity logs of any kind” are stored by Mullvad. Also, the fact that the team behind the project embraces a minimal data-retention policy so that you can keep your online identity to yourself. However, in some cases (“making payments by bank wire, PayPal, Swish, Stripe or are sending an e-mail or reporting a problem”) some data might be processed and GDPR and “other data protection” may apply. What we thought to be a brilliant move from Mullvad VPN is that you’re not required to provide them with an email address. Yes, you read that right. Not even when signing up. Why? How come? Well, when you sign up, they generate a random account number for you (the numbered account in the subtitle). This number is the only thing that you need in order to benefit from their services. That’s it. No names, no addresses, no emails, no phone numbers, just a random number that isn’t related to you in any way! Another cool thing about this numbered account thing (as if what I already told you isn’t cool enough) is that you can create as many numbered accounts as you want (since the system won’t find any duplicate information on you) and that multiple users can log in those accounts. As stated above, paying for Mullvad doesn’t necessarily expose your true identity, not to the company behind Mullvad and not for any other third-party. You might think of it as weird, shady or even downright ridiculous, but the first method of payment (and I believe the most encouraged one, too) is that you should put money in an envelope along with your account number and send it to them. They will simply add the number of days to that account according to how much money is in the envelope. More so, they have no way of finding out who made the payment or who the account belongs to. In order for this to work out as it should, you might want to avoid writing your name or real address on the envelope. Scrolling a bit further down lets us find an explanation on storing email addresses and transaction IDs. Since the company has a money-back guarantee, there’s no way of finding out who paid for what account without using data such as emails and transaction IDs. Nothing shady there. If you’ve decided to give this service a try, you have to follow a few steps in order to be able to benefit from its capabilities. First thing’s first, you have to register a Mullvad VPN account (yes, the one with the numbers). This process is fairly easy since all you have to do is pass the captcha and hit the “Generate account number” button. Once you’ve done this, you’ll receive three hours to test Mullvad, after which it’ll cost you €5 per month to keep the service running. Compared to other VPN services, Mullvad’s website doesn’t keep pushing you to purchase a subscription plan and the only way that you can see the “Buy Page” is by creating an account, logging into it and scrolling down. Downloading the app couldn’t be easier. Just hit the large “Download app” button on their homepage and push it again on the newly-opened page. If you want to use another version of Mullvad, just scroll down and you’ll be able to download the app for other platforms or learn how to configure it on ones that don’t come with native support. Usually, when you create an account on various VPN websites, you’re allowed to access a dashboard, which is just a page where you can perform various account management operations such as extending your plan, updating personal info and the such. 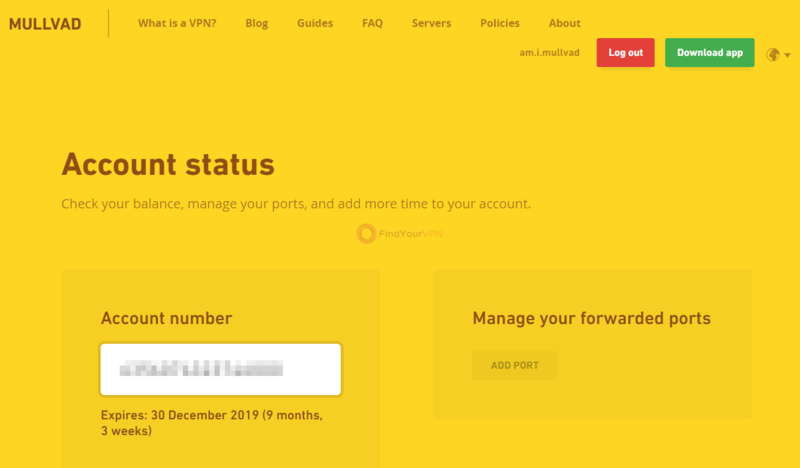 Since Mullvad VPN doesn’t work with the traditional name/email/password combo, there’s not much to do in the dashboard, except pay for your subscription plan, view your account number and see when your subscription will expire. Downloading the app can be done outside the dashboard just as well. For our sake an sanity, we’ve decided to elaborate on how to retrieve and deploy Mullvad on Windows computers, since we believe it’s the most commonly owned type of device in a household and, compared to smartphone apps where all you have to do is press a button and you’re set, installing it on Windows can sometimes raise some issues. Right, so, assuming that you’ve downloaded the installation package (which should be just an executable file), double-click it, grant it Admin rights if necessary and just… wait. There’s literally nothing you need to do, as the process starts by itself, runs by itself and at the end, it asks you whether you’d prefer Mullvad to run after setup is done or not. As you can see in the screenshots, we’ve installed Mullvad version 2019.1. You’ve passed the download and installation tests, now it’s time to get serious. 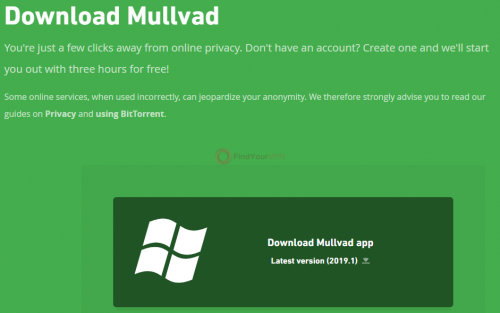 After it launches, Mullvad VPN automatically minimizes itself to the system tray and briefly displays an “Unsecured” notification before bringing the main window of the app in all its glory on your screen. Again, assuming that you’ve registered for an account, you need to paste or type the number in the designated field, whichever works best for you. 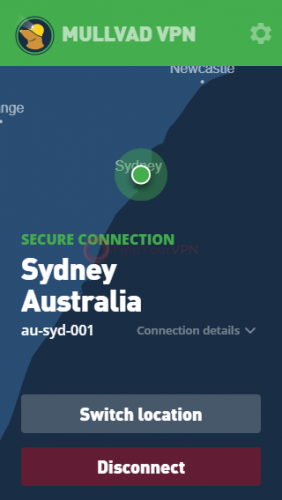 After logging into your account, the application displays your real location in the main screen for a brief moment then quickly establishes a secure connection to one of their servers. Of course, you can switch servers after the connection has been established. At first sight, we have to say that the interface seems quite user-friendly, not a lot of complicated functions that you can easily get lost into, just a map, a bunch of buttons and minimal details regarding the connection. Also, if you’re using Windows 10, you’ll notice that Mullvad doesn’t even have a taskbar icon of its own since it apparently only runs in your system tray. If you bring it into focus, it’s there, you can use it, mess around with it, but clicking outside the window hides the app in the tray as quickly as it was spawned. So, aside from the main window being as non-intrusive as possible, the app also comes with large buttons that let you switch the current server, disconnect from Mullvad, view connection details and configure a bunch of settings. I’ve got to say, this VPN service provides you with the standard VPN experience, no complicated stuff, additional functions and all of that. You just log into your account, connect to a server of your liking and that’s kind of it. We explored the settings section of the app and couldn’t find many parameters that you can modify, which is really awesome for a novice who doesn’t fully understand the implications of tampering with security features but might not be entirely convenient for the tinkerer types who like to be 100% in charge. Basically, the “settings” section of the app consists of two important categories: the “Preferences” and the “Advanced” ones. The former can be used to toggle launching the app upon system startup, automatically connecting to a server upon launch and local network sharing. 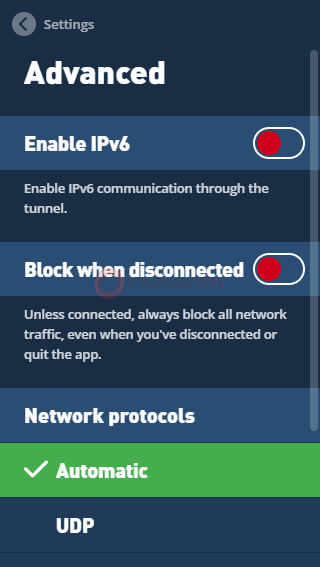 The latter lets you enable IPv6, block connections when disconnected from Mullvad (this is commonly referred to as the Kill Switch), choose your favorite network protocol and set the OpenVPN MSS value or revert to its default one. So, as you can see, there is a bunch of things that you can mess around with, but the possibilities are somehow restricted. Mullvad lets you use several servers to protect your Internet connection and hide your identity from prying eyes, but, unlike some other VPN service providers, it offers three types of servers: regular (OpenVPN) ones, WireGuard servers, and Bridge servers. On the server page, you can also see the situation of the servers, whether there’s some maintenance going on for some of them and also helpful advice if you encounter difficulties. The regular servers can be also used with OpenVPN by specifying a particular region or server. WireGuard servers use a public key and multi-hop port that are available in the list of servers. Last, but not least, bridge servers can come in really handy if the user is stuck behind a firewall and can’t access the servers directly. * Append .mullvad.net to any name, e.g se1.mullvad.net. * Append .mullvad.net to any name, e.g se1-wireguard.mullvad.net. As you can see, the total number of servers isn’t exactly large (356), but the variety of servers and all the extra features make it up for lack of numbers. Kudos for that! 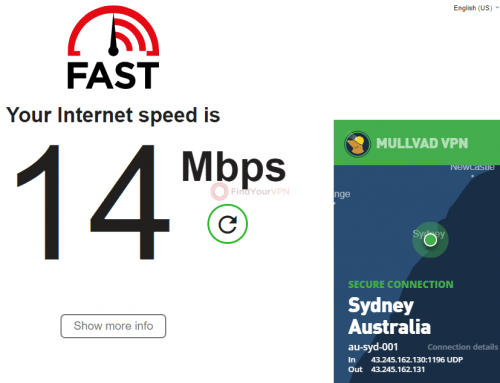 It’s time to talk a bit about how you can get in contact with the team behind Mullvad VPN, should you ever require their assistance. First thing’s first, they have no live chat support, so if you’re a fan of chit-chatting with tech support members, we’ve got bad news. However, if you care more about keeping your stuff to yourself and privacy, then here’s some good news. You can contact them through email and even use a GPG key while doing so, making sure that your conversations will stay between you and them. The GPG key can be downloaded on your PC by simply scrolling down on their website and click the “GPG Key” hyperlink in the “CONTACT” category. If you don’t know what GPG is and how to use it, use the “?” hyperlink to access a quick guide. An onion service is also provided for you in the same section. 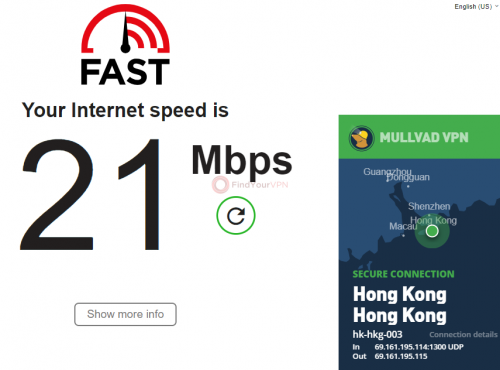 As you probably know by now, we’re devoted to a couple of tools whenever it comes to testing a VPN service’s reliability and speed: IPX and fast.com. 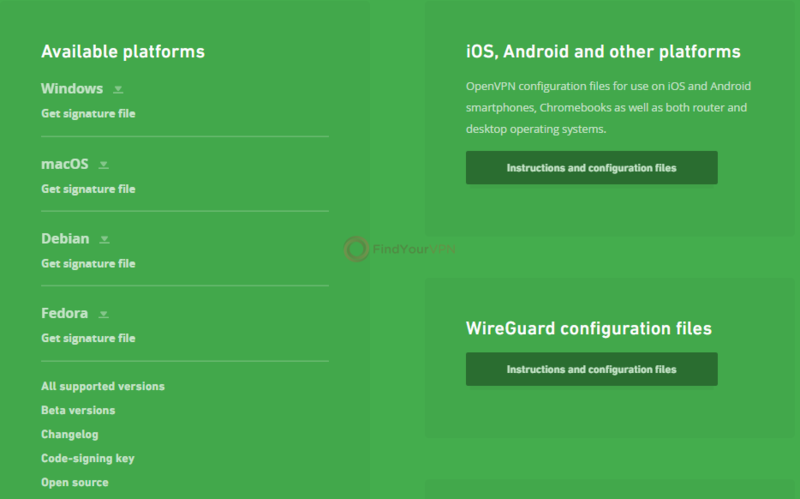 We’ve used them before with every other VPN provider we’ve tested and for the sake of accurate results, we’re gonna keep using them, so you can rest assured that no VPN service will have the upper hand because of that. 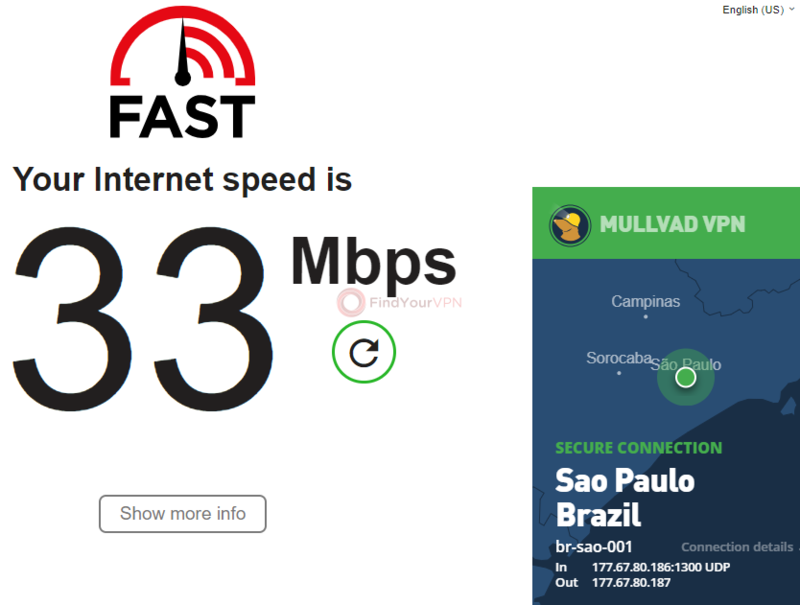 If you prefer a quick test and don’t care much about our tests or results, Mullvad VPN offers such a tool on their website. You can access it anywhere on their website, just click the “am.i.mullvad” hyperlink next to the “Log in” button (if you’re not logged in) or the “Log out” button (if you’re logged in). Let’s start at the beginning; our IP address along with everything that would give away our identity and location have been successfully spoofed, so instead of seeing our real IP and location data, we were presented those of Mullvad’s server. 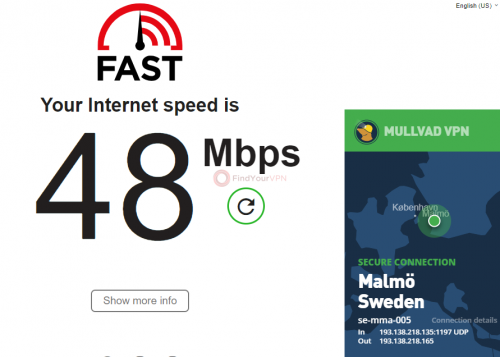 The ASN, ISP and domain name were replaced by AS39351 31173 Services AB, 31173 Services AB, and 31173.se and the IP type was changed to non-residential (data center). No chinks in this armor piece. Moving on, IPv6 geolocation data was not available (good thing), no DNS leaks were detected, WebRTC data pointed to our internal IP address (as it should), respectively to a Mullvad server’s IP address (Public), so no worries there either. The only data that was “exposed” were a bunch of details such as the user agent, operating system and architecture used, which couldn’t be used to reveal our true identity or compromise our security. Good job! Our test results can be accessed from here. 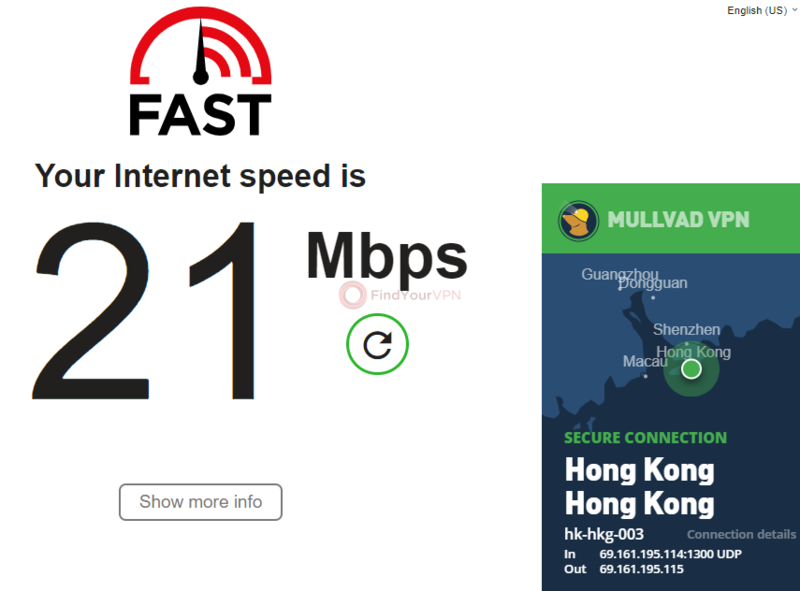 We have to say, we’re impressed by the speed values, especially since we’ve reached rather high ones in countries that are not exactly popular for their fast Internet. The connection remained constant, no random drops or spikes and upon switching servers the Kill-Switch worked as it should: our default connection was killed until the new connection was established. We’ve attempted to bypass the inconvenient geo-blocking for some popular services during our testing and came to understand that you simply can’t have it all. We’re only going to name a bunch of services that, unfortunately, couldn’t be unlocked by Mullvad VPN for the wide public: Netflix, Hulu, Spotify, and Amazon Prime. Sometimes, the Netflix service seemed to work but would drop shortly after. However, some social platforms and apps such as Facebook, Twitter, Kik, YouTube, various Google services, Snapchat, and the sort have been effortlessly unlocked. To wrap things up, we believe that Mullvad VPN is a strong, reliable security tool that offers you an extra level of anonymity by not even WANTING to “meet” you in the cyber world and instead creating impersonal numbered accounts and suggesting that you’d pay for their services using unsigned envelopes with only the account number in them. That’s some level of commitment that you don’t get to see every day. Their security was great, no leaks were detected, our integrity and our computers’ remained intact and our identity anonymous during the usage period, and the speed values that their servers yielded is quite impressive. The range of servers isn’t exactly large but the fact that you can access three types of servers with added security turns it into something to think about. The price for their monthly service is a low one, compared to other VPN service providers, but here’s the catch: there’s no volume discount. However, you can pay any amount you want as long as it’s more than 5 EUR, as no coin goes to waste. An example available on their website says that 17 EUR will buy 100 days and that’s another nice thing that they have going on. The customer support isn’t complete without a live chat system, but since they care so much about not exposing your identity, it’s also a good measure. So it’s safe to say that the lack of a live chat is kind of like a feature and not a bug. An unfortunate aspect of this VPN provider is that it can’t unlock some heavily sought services such as Netflix and Hulu, but again, you can’t have it all. 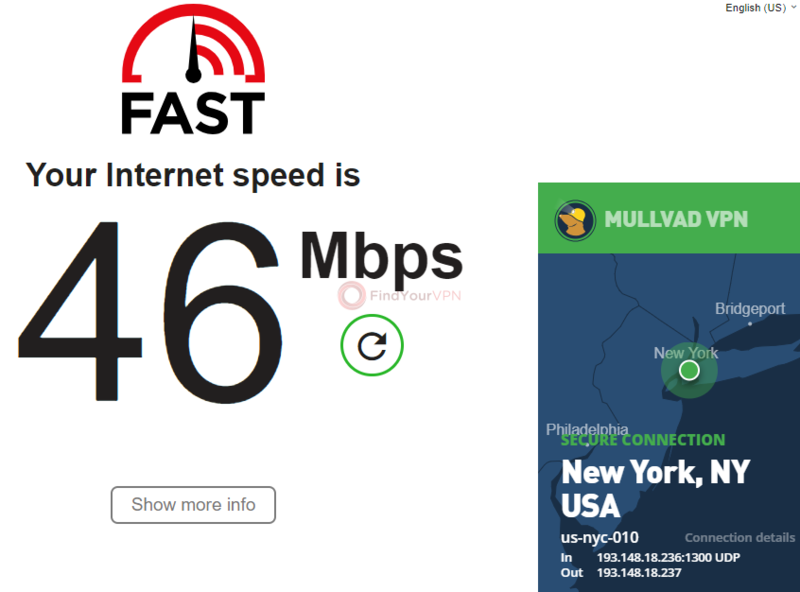 Mullvad VPN has received a 4.27/5 rating.